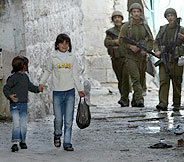 Palestinian girls were followed by Israeli soldiers in Bethlehem on Friday during a break in the city's curfew. 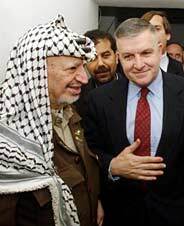 Yasir Arafat, seen in a photograph handed out by his office, talks to U.S. envoy Anthony Zinni in Ramallah on Friday. BETHLEHEM, West Bank, April 5  President Bush's envoy to the Middle East broke Yasir Arafat's diplomatic isolation today, meeting in Ramallah with the Palestinian leader while Israel accelerated its military sweep through the West Bank despite President Bush's call on Thursday for a withdrawal. Israeli officials declared that their military mission would continue until it destroyed the Palestinian "terrorist infrastructure" or until Mr. Arafat cracked down on violence himself. Fierce gun battles in several West Bank cities and towns left at least 26 Palestinians and 1 Israeli soldier dead. Among those killed was the West Bank military leader of the Islamic group Hamas, whom Israel accused of masterminding last week's devastating suicide bombing that killed 26 Israelis in Netanya at a Passover Seder. The Israeli military campaign began after that attack. Protests erupted again in Arab cities, and Israel's northern border continued to heat up. Israeli warplanes struck targets in southern Lebanon in retaliation for antitank grenades fired across the border by the Lebanese group Hezbollah. Maj. Gen. Giora Eiland, the Israeli Army's planning chief, said that Israel had an understanding with the United States to permit the operation to continue. Israel has seized control of every West Bank city but Jericho and Hebron, where forces have taken some positions in Palestinian-controlled territory, Palestinian officials said. "No one expects us to leave these places just to encourage the terrorists to continue causing us this terrible damage," General Eiland said. In a speech on Thursday, Mr. Bush harshly criticized Mr. Arafat as not fighting terrorism but also said, "I ask Israel to halt incursions into Palestinian-controlled areas and begin the withdrawal." Palestinian officials had interpreted Mr. Bush's remarks on Thursday as a demand for immediate action. "What a big `no' to Bush, in the form of the shell of the tank," said Saeb Erekat, the Palestinians' chief negotiator. In his speech, Mr. Bush did call for "immediate action" to ease the Israeli closure on Palestinian areas and to permit "peaceful people" to return to work. There was no sign of such action today. The speech caught Israel's prime minister, Ariel Sharon, off guard, Israeli officials said. Raanan Gissin, the spokesman for Mr. Sharon, said, "We didn't get any green light from the United States, we didn't get a red light." He said there was a "clear understanding" between the allies. "When it comes to the basic issue of defending Jewish lives, defending the lives of the citizens of the state of Israel," he said, "Israel has the right to exercise self-defense." Israeli officials concluded that by omitting a specific deadline for the Israeli withdrawal, Mr. Bush had allowed Mr. Sharon some leeway. Still, the Israeli mission appeared suddenly to be working against a clock. Israel would find it difficult to sustain such an aggressive operation during Secretary Powell's visit, some Israeli officials said. That meant, one official said, that the mission now had "days and not weeks." During the meeting today in Ramallah, Mr. Bush's envoy, Anthony C. Zinni, the retired Marine Corps general, asked Mr. Arafat to appoint a committee to discuss preparations for the planned visit of Secretary Powell. Tonight, the Israeli government blocked the first scheduled meeting between General Zinni and that committee, Palestinian and American officials said. Mr. Sharon welcomes General Zinni's mission but has little confidence it will succeed, Israeli officials said. Israel has declared Mr. Arafat an enemy, but the Bush administration has grown increasingly alarmed that the fighting here could disrupt the region and its own strategic aims, including a possible attack on Iraq. The Israeli offensive is overwhelmingly supported by the Israeli public, and it has boosted Mr. Sharon's flagging popularity, according to polls published today. Palestinian suicide attacks have subsided as the operation has gathered force. Some Israeli and Palestinian officials noted that the pattern has been for such attacks to come on the heels of Israeli incursions, rather than during them. Here in Bethlehem, the standoff continued around the Church of the Nativity, revered by Christians as marking the place of Jesus' birth. About 200 Palestinian gunmen are believed to be holed up in the church, surrounded by Israeli forces. Today, four priests slipped out of the church with the help of the Israeli Army, the army said. General Eiland said that Israeli forces would not storm the church. But, he said, "We are determined to stay there, surrounding the building, until those who captured those hostages give up or leave this place." People reached by telephone inside the church have denied that anyone is held there against their will. One person said that there were 10 wounded inside. General Eiland, speaking in Jerusalem, said that Israeli forces found five Palestinians dead here whose bodies had been "treated in a brutal way." He said they were suspected collaborators. The general added that, in the weeklong operation, Israeli forces had rounded up about 1,200 Palestinians. Among them, he said, "many dozens are very dangerous terrorists, people we have been looking for a long time." He said that Israeli troops had found "more than 2,000 weapons of various kinds, including types not permitted according to the agreements with the Palestinians." Some men released here today showed abrasions on their wrists from plastic handcuffs that they said they wore for three days. They said they also wore blindfolds and were asked only basic questions, such as their names. Israeli patrols continued to range through the city and to cordon off the area around the Church of the Nativity, and, periodically, gunfire still rang out. One armored vehicle paused as it rolled down a major boulevard to let loose several earsplitting bursts of machine gun fire. But the Israeli curfew was lifted for a few hours this afternoon and some Palestinians moved through the streets, many of them looking for food or medicine. The shelves of a vegetable store were stripped bare by looters, but stores carrying nonessential goods, like shoes, went untouched. Ilyas Thaljieh, 32, stopped two people on the street, anxiously asking them if they had passed an open drug store. He needed medicine for his 9-month-old son, he said, who had an infection in his eyes. "He cannot see, my son," he said. In the village of Tobas, in the northern West Bank, Israeli troops tonight killed six members of the Islamic group Hamas, Palestinians said. Among them was the military leader of Hamas in the West Bank, Qais Odwan, the man held responsible for the Netanya attack. Palestinians officials said that a 14-year-old girl was also killed by the Israeli strike, conducted by soldiers and tanks. Hamas promised retaliation for the attack. Some Palestinians reported that the leader of the Aksa Martyrs Brigades, a militant group linked to Mr. Arafat's Fatah faction, died in Nablus tonight when a bomb he was assembling exploded. The leader, Naser Awais, is among Israel's most wanted men. Members of the militant group said that they were checking the reports of his death. The toll today was heaviest in Nablus, where at least 15 Palestinians died. Backed by American-made Apache helicopters firing machine guns, Israeli tanks and armored vehicles moved through the city and encircled the kasbah, a dusky warren of stalls selling figs, candy and sneakers. "The battle did not start yet," said Naser Badawi, a member of the Aksa Brigades. "They are still in their tanks. The battle will start only when they leave their tanks and enter on foot. We are waiting for that." Four wanted people were killed by a tank shell in the refugee camp of Askar in Nablus tonight, and residents there reacted by killing a Palestinian they suspected of directing the fire. At the edge of the kasbah, Abu Waddah and his wife, Najwa Um Waddah, had taken to sleeping with their children on the floors of their kitchen and bathroom to avoid the gunfire. When shooting suddenly broke out again, the entire family dropped to the floor. "Where is Bush?" asked Najwa Um Waddah. "We want to live like any other human beings." She said that "the Israelis should pressure their leader, in order for us to live in peace." But polling released today suggested that Israelis were happy with their leaders' decision for an all-out military operation. A poll by the newspaper Yedioth Ahronoth found that 62 percent of Israelis "have faith in Ariel Sharon to lead the country successfully," up from 45 percent in March. In addition to striking at nests of gunmen, the Israeli operation appeared aimed at the authority of the Palestinians' governing institutions. Tonight, Israeli forces searched the home of the Palestinian minister of information, Yasir Abed Rabbo, Mr. Abed Rabbo said. In Nablus, a tank burst through the gate of the home of the mayor, Ghassan Shakaa, said Suha Shakaa, the mayor's daughter. Israeli troops arrested all the men inside, including Mr. Shakaa's two sons, Ms. Shakaa said. The mayor was out of the country.